What? No comment on the Sonic the Werehog tease!? That was my favorite part of this entire arc. THANK YOU. I was disappointed that the article didn’t mention all the build-up to an Unleashed-esque plot in the near future. The tremors, the werehog tease, the fact that the covers have a very familiar looking purple energy destroying the world behind them… Heck even Spagonia is mentioned. All signs seem to point to Unleashed, and my God, I CAN’T WAIT. 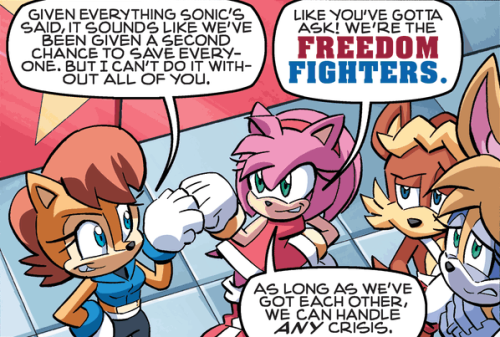 Archie has been reminding us that they haven’t forgotten about Werehog with their Off-Panels, so to see it finally become canon (well, as canon as this comic can get) is very exciting. The review is petty good, sadly I find myself disagreeing on the overall points of it. Granted I only read up to issue 252 and 253 of the new arc before giving up on the comic entirely due to a massive dissapointment in how fast and easy every threat in the comic is dealt with, Nagus and Silver-Sonic are the prime ofenders here. The story is also extremely poorly written to me with the comics need to constantly halt eveerything to run exposition and introduce new characters left and right, most of the new characters aren’t even that important to the plot to warrent an introduction yet in my opinion. Looking ahead, I may be able to enjoy the comics far more then I’ve been able to since starting with issue 186. A lot of the stuff they dropped were things I really either hated with an intense passion (Julie-Su) or things that I couldn’t get over. A lot of the concepts we’re going to be getting will be grand step up for me as well. 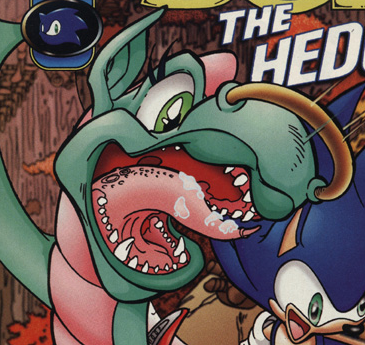 The Chaotix are apparently detectives now which is great considering I have no idea what the hell they were supposed to be before. I was hoping Omega would be re-written a bit too but… oh well. Just something about him being a straight up hero and working for G.U.N doesn’t sit right with me. But when it concerns Sonic, he has memories of his parents right? Same goes for Tails. 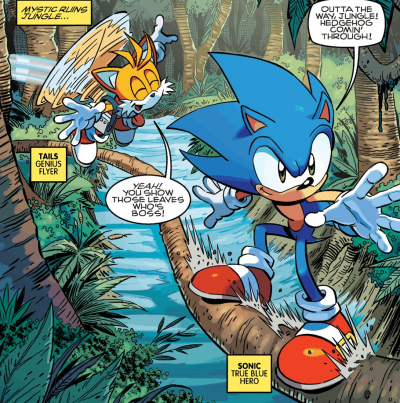 I wonder how he’ll handle this since, I don’t think Sonic and Tails would be okay with their parents no longer existing due to a universe shift. Actually, with Sonic slowly replacing his old memories with the new ones, it’s likely that he’s forgotten all about his former parents. Hence they’ll never be mentioned again, for obvious reasons. I think they remember them just as well, they just don’t wanna talk about it. There was talk of the older memories being overwritten in Eggman’s mind but I didn’t know what exactly that meant or how much. Is all of it going to be changed in their minds eventually? If so, there would be no point in this arc where they got them all back. Is it only going to just be a select few memories that remain? If so, how does that work and why? And what would cause the memory overriding process to just stop when it took enough memories away. I think he meant that everybody will have a hard time remembering which event happened in which version of the Prime Zone. I really like how it seemed like a reboot at first, but then started to kick in the existence of the old Prime Zone in. 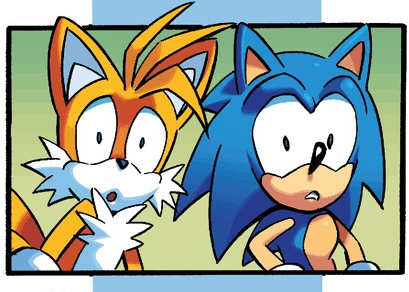 It pretty much answers the question, “What if one continuity of Sonic discovered the existence of another?” Also, I like how Sonic developed this arc. What’s interesting to think about is what Naugus will do now that he’s out of the throne. I think he will make vague references to his lackey, and be a little sad that he’s gone. 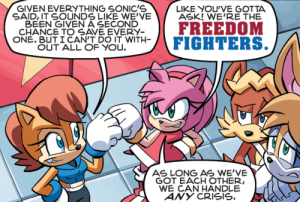 With this new scenario ahead (which part of me loves because of the more consistent artwork and games references)… do the Freedom Fighters really need their memories of the previous world? If many of the characters were removed because of the lawsuit, does it mean they will make an eventual return or are they really gone for good? But when it comes to the saga itself, I have to say I really enjoyed it. Since this new story is directed to be Sonic Unleashed-based, I’m completely looking forward to see the entire new world with beatiful artwork (because that’s what I loved from that game: the environments). My only downside was to see Sally using those energy blades… because I felt like she didn’t need them. Hey, don’t get me wrong, they were awesome, but IMO sometimes a character doesn’t need an OP weapon to be strong. Sally IS strong without the OP weapon. 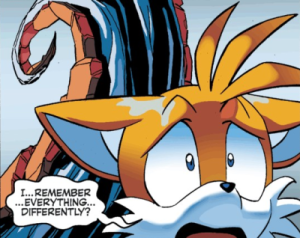 It would be kinda hard for Sonic and Sally to continue where they left off before she was roboticixed if they didn’t have their memories of that time, Naugas haveing his memories sets up a plotline that Ian can follow if he wants to and without their memories it makes the past comics irelvant and useless. Sally has a shirt, and pants, ruined forever! my mistake it was actually 147 is when i stop reading, man so long ago lol th good the bad and the unknown did they ever explained where that gold gamma came from fully and where is he? I’m a bit late to the party here, but better late than never I suppose. The art in 255 was off putting enough that it inspired me to make my own version of Bunnie’s flashback scene. http://fav.me/d73vpwh I’ll let each person decide if mine is better than Gaylord’s or not.